How do you see the SPX closing for the month of April 2019? Congrats to @Ken34 the March 2019 Contest Winner! On to the next! 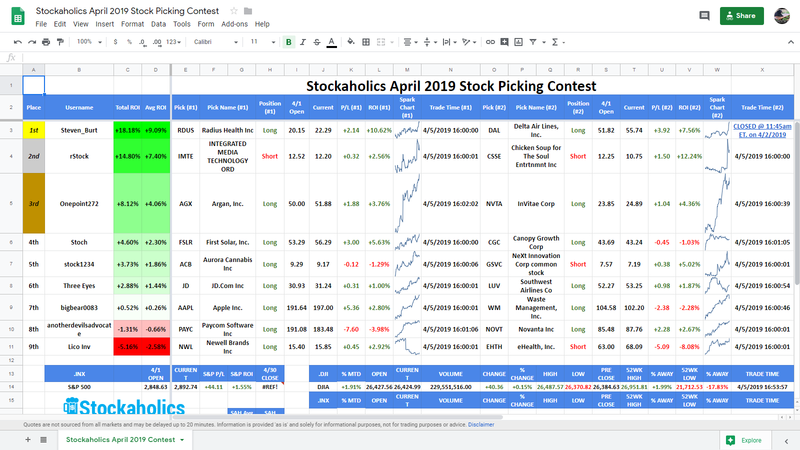 The March 2019 Stock Picking Contest starts at the opening bell on Monday, April 1st, 2019. 3.) Both of your picks MUST each be at least $2 at the bare minimum! If you pick something that is under $2 then your pick will not count, and you will not be entered into this month's contest! 3.) 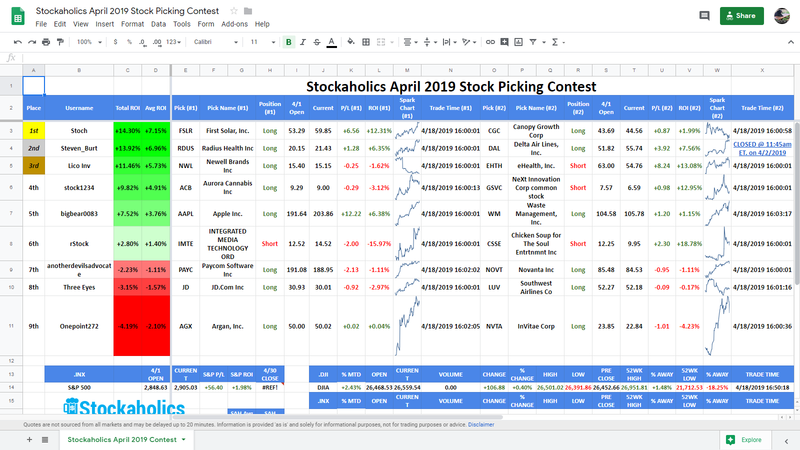 If you don't post both the ticker AND the direction (LONG/SHORT) you won't be added to the list of contestants for this month's stock picking contest! 5.) Picks absolutely MUST be posted in here before the 9:30AM eastern time cash market open on the first trading day of the month! 9.) You may choose to close out one or both of your picks at any time during the trading month. PLEASE POST YOUR OWN CLOSING PRICE(S)! We will be using the intraday 1 minute closing price using the time stamp of your post on Stockaholics for when you closed out your pick. You will need to state which pick(s) you are closing out as well as the price & the time of when you closed out. I will be confirming that your closing price is correct by looking at the 1 min. intraday chart. If it is not correct, I will then post up your correct price and input that into the live spreadsheet. If you choose to close out after the trading day is finished (after the closing bell), you will then get the next day's opening price. How does Stockaholics see the outcome of the S&P for the month of April? No monthly poll tally for Stockaholics this month. Credit goes to the UP votes! 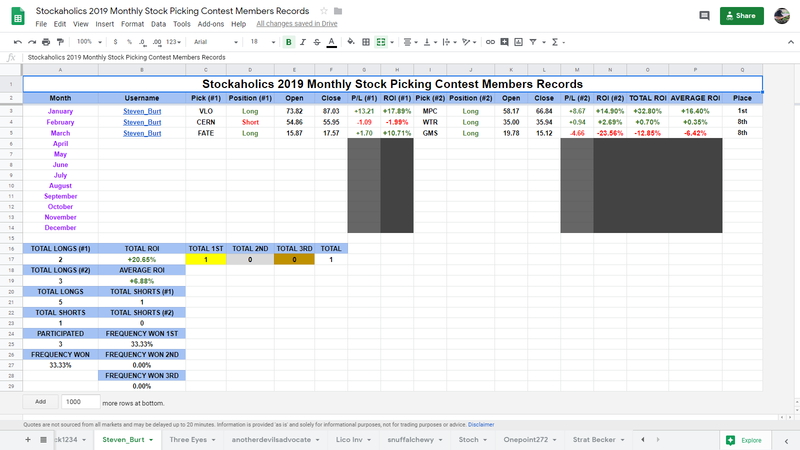 1) For purpose of the spreadsheet record flat is currently based on +/-1.00% or less. Of course, everyone can define flat any way they choose. 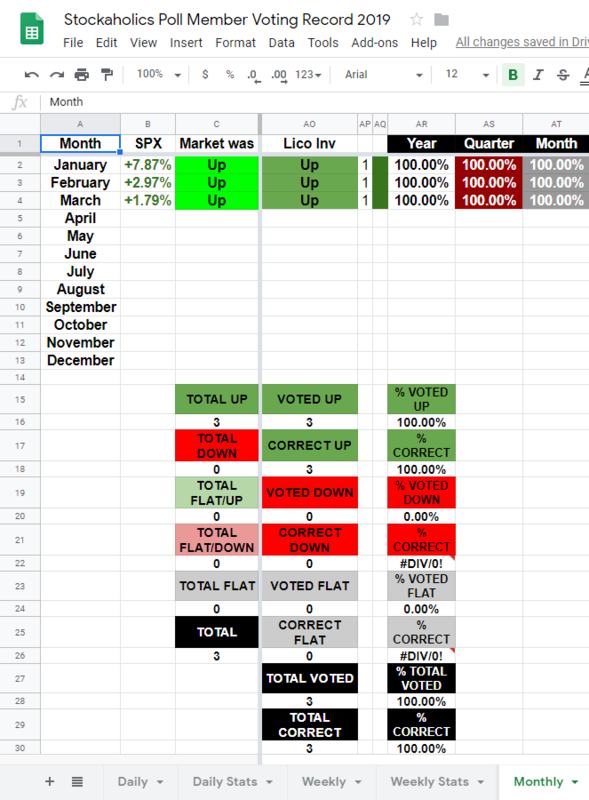 4) Starting and ending points based on official month ending close of the market. 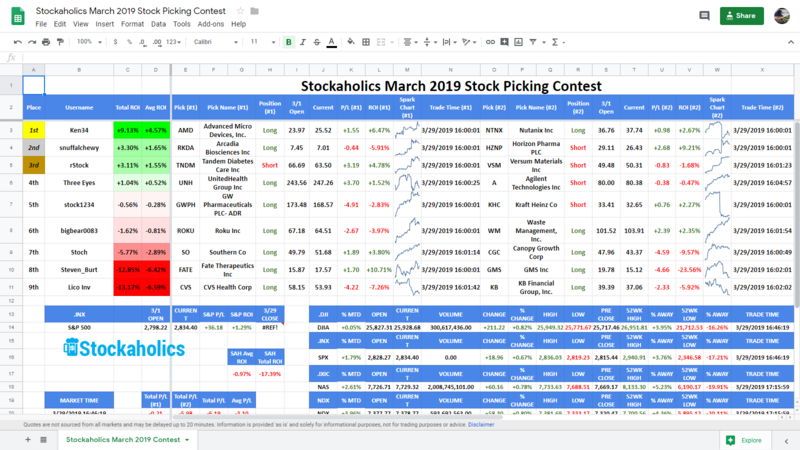 Congratulations to our March 2019 contest winner and 1st time winner of the monthly contest (1st time winner in Q1!) @Ken34! Some worthy mentions also goes out to our 2nd place winner @snuffalchewy and 3rd place winner @rStock! 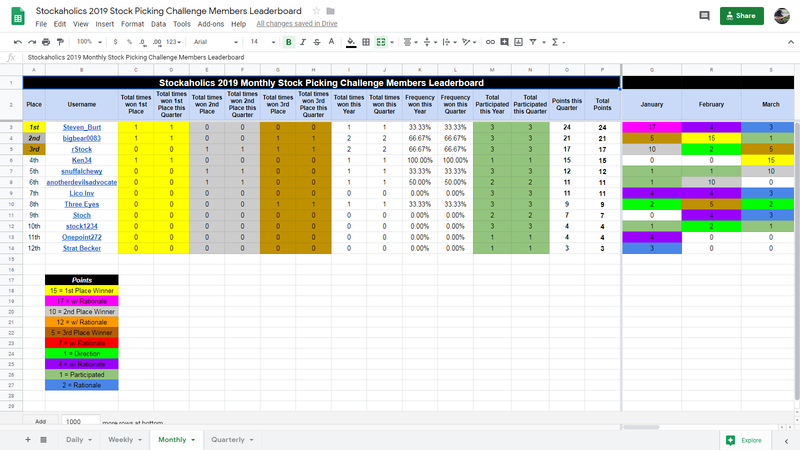 Congratulations to @Steven_Burt our Q1 monthly contest members leaderboard winner with 24 points this quarter! 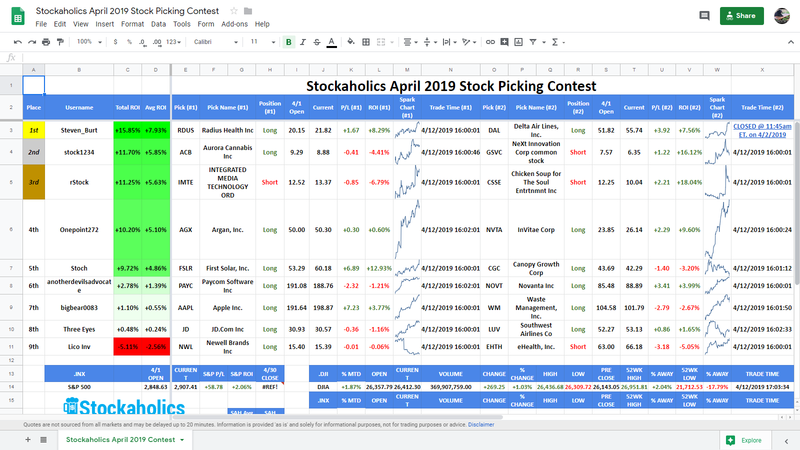 And finally, we have the complete monthly stock picking contest members history which includes every pick from our active participants this year. @Lico Inv is our monthly poll percentage winner for Q1 with a 100.00% voting accuracy this quarter! Longest active monthly poll winning streak belongs to @Lico Inv with 3 straight correct monthly market calls. 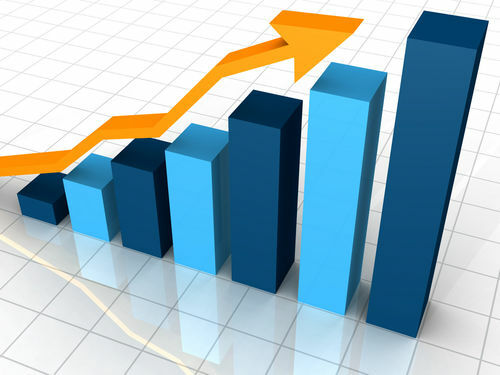 Best overall monthly poll percentage leader in 2019 belongs to @Lico Inv at 100.00% monthly poll voting accuracy this year. Best overall monthly poll percentage leader this quarter belongs to @Lico Inv at 100.00% monthly poll voting accuracy this quarter. Most consecutive correct monthly market calls in 2019 belongs to @Lico Inv with 3 correct calls. Most consecutive correct monthly market calls ever belongs to @stock1234 with 8 correct calls in 2017. 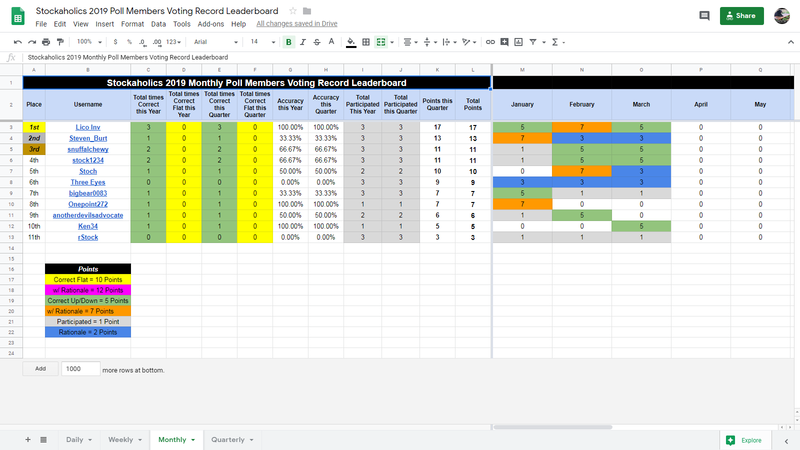 Congratulations to @Lico Inv our monthly poll members leaderboard winner with 17 points this quarter! 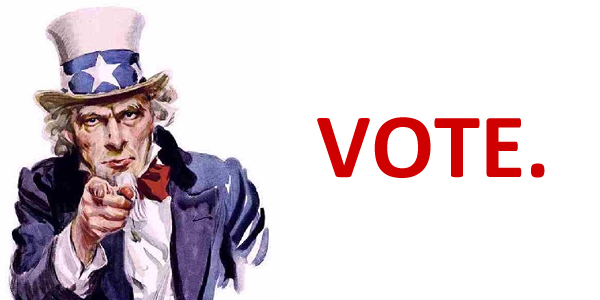 Please post your Vote on this thread and make sure to also click in your Vote on the poll at the top as well by 9:30AM eastern time on Monday! 'm saying Market UP. After last week's bullish performance, closing at the high of the week, it is in a position to take out the March 21 high at 2866 and proceed to test the Sept 2018 high. However, if it fails to follow thru and reverses to close under Friday's low of 2820.25, then it could see larger downside. Close DAL please 55.74 10:45 ET - Thanks! Nice call on Delta Airlines Steven , but taking your marbles off the field so soon? I don't blame ya, often times I've wished I'd have done that with real trades. thanks, definitely I took the gains too quick. If I was trading it live I would have taken 1/2 and let the rest ride, probably trailing the ma(9). Shout out to our current leader -- @Steven_Burt! Shout out to our current leader -- @Stoch!